When someone talks about a simulator, the fact that “it doesn’t feel like the real thing” almost always comes up. While that might not be a big deal when you’re teaching instrument procedures, this lack of “feel” turns most devices into a paper weight when you try to teach basic aircraft handling. The primary culprit of “simulator feel” is the traditional spring-loaded yoke system that has been the industry standard since the 1940’s. We’ve known that force feedback systems are the answer to this problem, but these systems have been hugely expensive and delicate components that aren’t even an option on most general aviation training devices … until now. The Redbird Control Loading system is a mechanically simple, inexpensive force feedback system that takes the realism of your simulator experience to a completely new level. 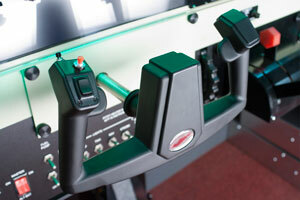 Control Loading is without doubt the most valuable upgrade you can make to your Redbird training device. It allows your customers to learn how the aircraft controls will feel at various trim and airspeed combinations. In fact, you’ll be able to teach the core building blocks of flight on the ground before a customer ever tries to manhandle the real aircraft into level flight. Unlike our competition, the Redbird Control Loading system is small, clean, quiet, and on our single yoke simulators, portable. The Control Loading system measures the amount, velocity and density of the airflow over or around the control surface. The trim of the airplane has a large effect on the control force for pitch and is a primary consideration of the Control Loading system in pitch. The system also takes into account any inherent force that is applied by the actual control system in the class of airplane simulated. These measurements are intergraded into the aerodynamic modeling and the Control Loading system operates in parallel to the fight dynamics simulation. The calculations for the system are performed at the same rate as the aerodynamic calculations. This reduces lag in the Control Loading systems computation of control force and travel. After the Control Loading system calculates the force each control should simulate, the system issues a command to the mechanical devices responsible for generating the requested control forces. The system uses electric motors, pulleys, springs and sliding tracks to change the physical force required to move the control input device. The physical movement or change in tension of the control input device is accomplished within 20 milliseconds of the command being issued by the control loading system.